Thank you to Butler County Ohio Visitor’s Bureau for inviting me to experience some of what Butler County has to offer. A couple of weeks ago, I had the opportunity to explore Butler County Ohio with my mom for some girl time. While the focus of our trip may have been exploring the donut trail that winds its way through the county, we found plenty of ways to walk off some of those calories that were consumed in our early morning undertaking. 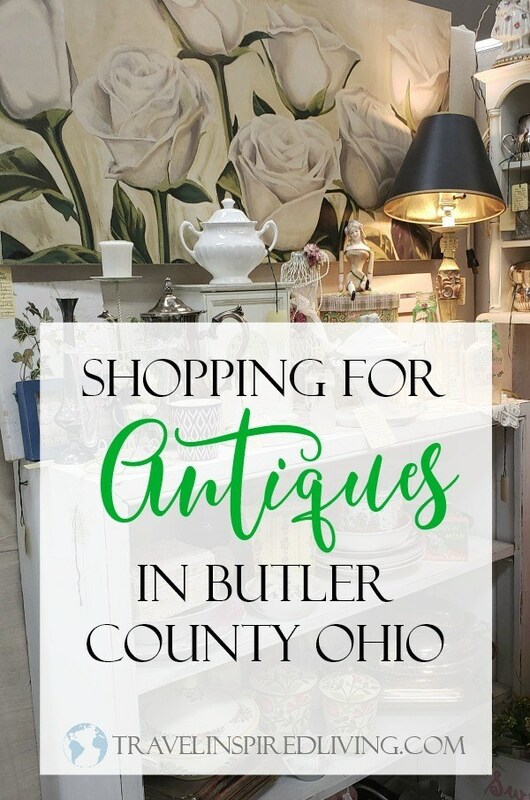 I promise I’ll share everything we packed into our stay in a future post, but for now, I’m going to share where we found the best vintage items and antiques in Butler County. Before I do that, I’m going to share a bit of background and what I was looking to buy. I started collecting milk glass a couple of years ago. 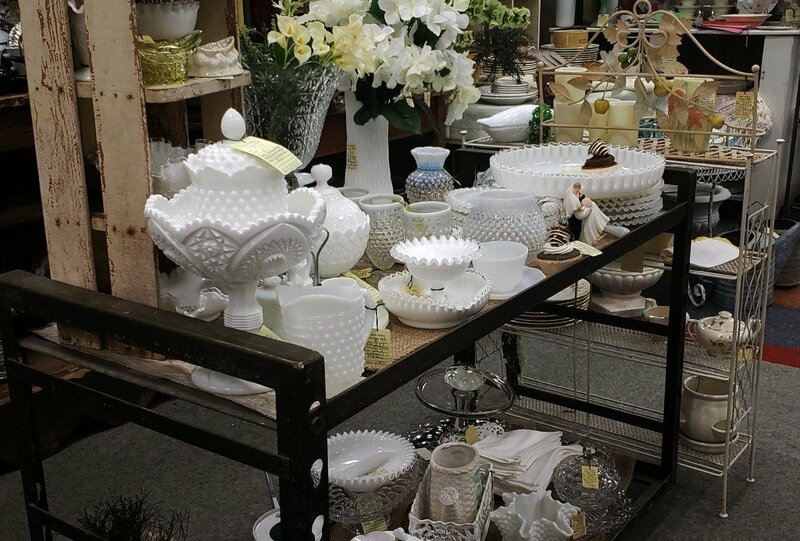 Somehow between picking up a milk glass vase here and a milk glass vase there, I have amassed quite a large collection. 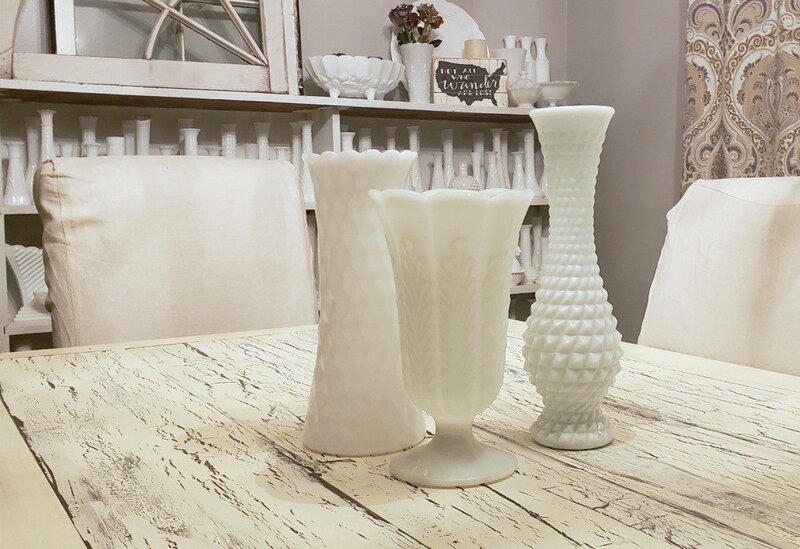 I’ve even been told that my milk glass collection could be considered a roadside attraction if I could convince my husband to build me a she-shed to store the collection. For those of you who have been here a while, you know I can’t pass up a great roadside attraction, so I must admit, the idea intrigues me. But I’m getting off topic. My collection has grown exponentially, and I now have more vases than I will probably ever use which forced me to move on to bigger items like fruit bowls, urns, lamps and pitchers. Several months ago, I saw a photo of a punch bowl and decided that I needed not one, but three for my collection (I’m saving my collection for big events- like ahem…a child’s wedding) and the search began. 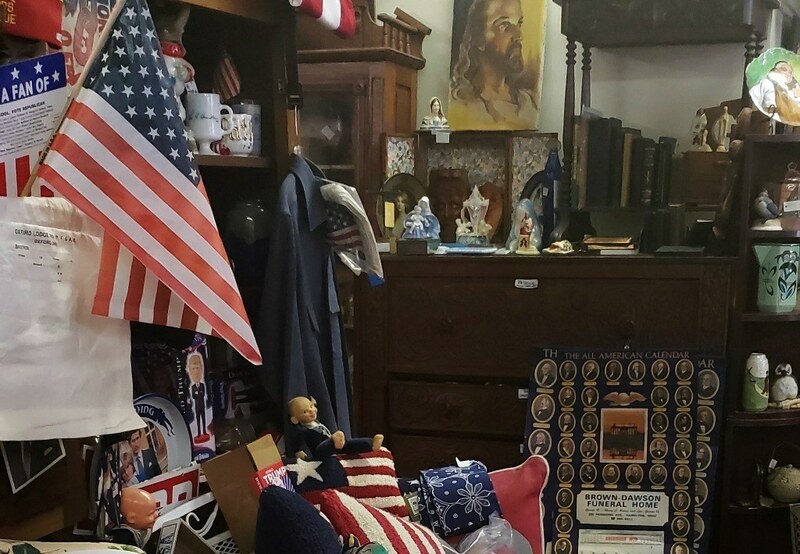 When I drove my minivan off the freeway and into Butler County, it was with thoughts of antique stores swimming through my head, as I had two items that I specifically wished to purchase- an item that I could use as a shelf to display some of my husband’s collectibles and a single punch bowl for me. After a stop at Jungle Jim’s International Market (5440 Dixie Hwy. Fairfield), which is like Disney World for the foodie, my mom and I found a Goodwill to browse. 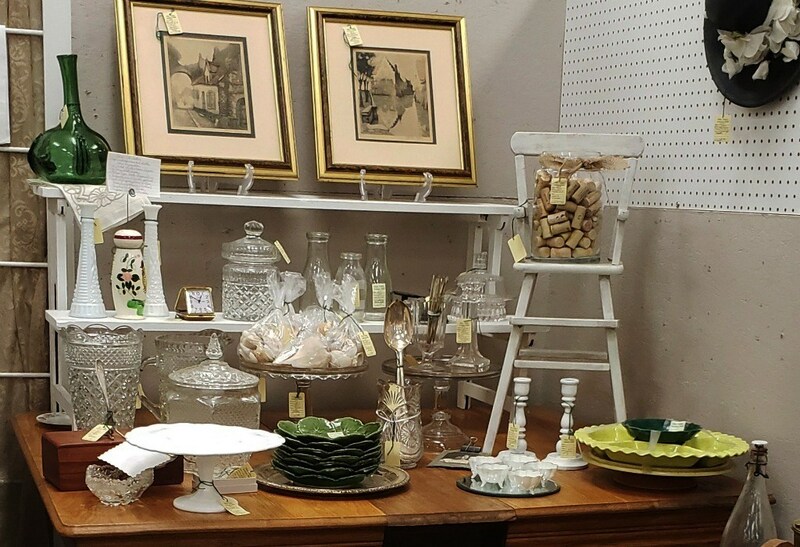 It was okay as far as Goodwill’s go and I did find a couple pieces of milk glass, but I thought they were a bit pricey and decided not to open my pocketbook. We continued in search of another thrift store and were rewarded just a block away with Valley Thrift Store. This store was huge and busy as unbeknownst to us, it was sale day. Yep. Just our luck that EVERYTHING in the store was on sale. We headed to the housewares and began our search amid the crowds. I can only imagine what a salmon feels like swimming upstream as I tried to make my way through the aisles with the huge cart that I was unwilling to part with. It was the last cart in the entire store and I was convinced that I would find enough items to justify the rage that was building up within my impatient self as I tried to maneuver around my fellow shoppers. 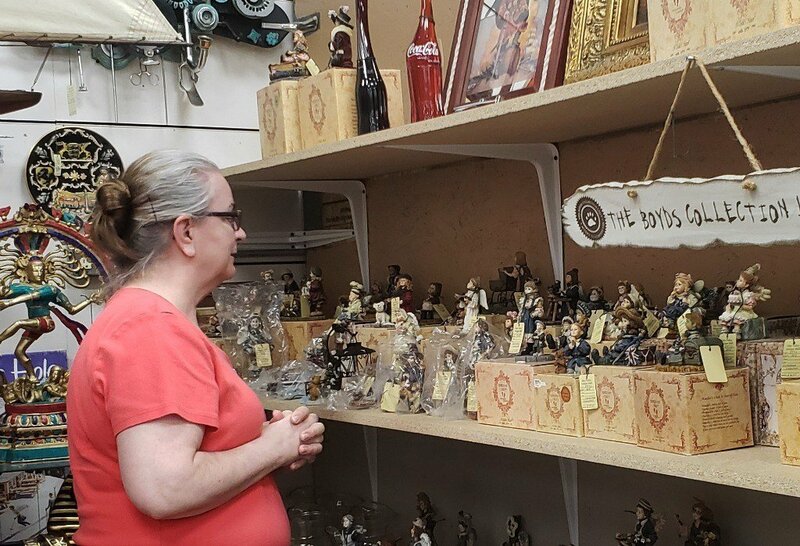 From my vantage point, I could spot splashes of white on the shelves and I prayed no one would reach them before I had a chance to determine if the pieces were purchase worthy. Mom and I devised a plan of attack and split up momentarily to search and conquer. Our plan worked well and within the hour, my mom had found a couple items and I had secured three pieces of milk glass that were unique to my collection. The best part? All three pieces cost me less than $8. I call that a win! Part of my collection in the background with my three new pieces found at the thrift store in Butler County. The rest of the day was spent checking out some of the murals in town, appreciating the sculptures and the architecture in the historic districts. The next day, we drove to Oxford to explore the downtown area. If you’re hungry, it is the place to be, as we spotted quite a few places to eat. Oxford is also the home of Miami University. On a pass through town, we spotted The Bird House Antiques. 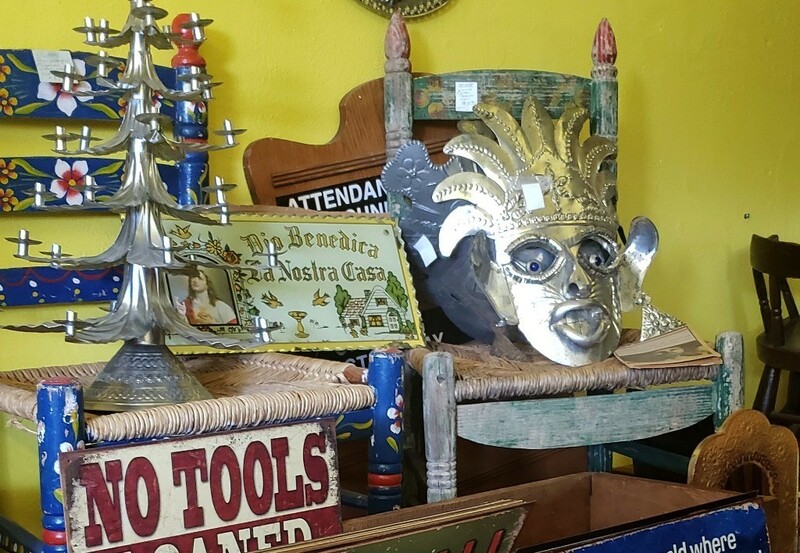 The store takes up space in two storefronts and both are packed full of vintage and antique items. I could walk through this shop several times and see something new each time because there is so much stuff but it’s not always easy to get around, especially for us gals who have some junk in the trunk or if you have mobility issues and walk with a walker. I did manage to find a wooden letterpress type tray tucked away in one of the rooms and decided it was just what I was looking for. One item on my wish list had been found. As we made our way back to Hamilton, we noticed Hamilton Corner Antiques. The building is as interesting as the collection of antiques you’ll find inside. Built in 1820, it has been a bar, hotel & grocery store. There’s even an original room that had been boarded over and no one knew about it for years. 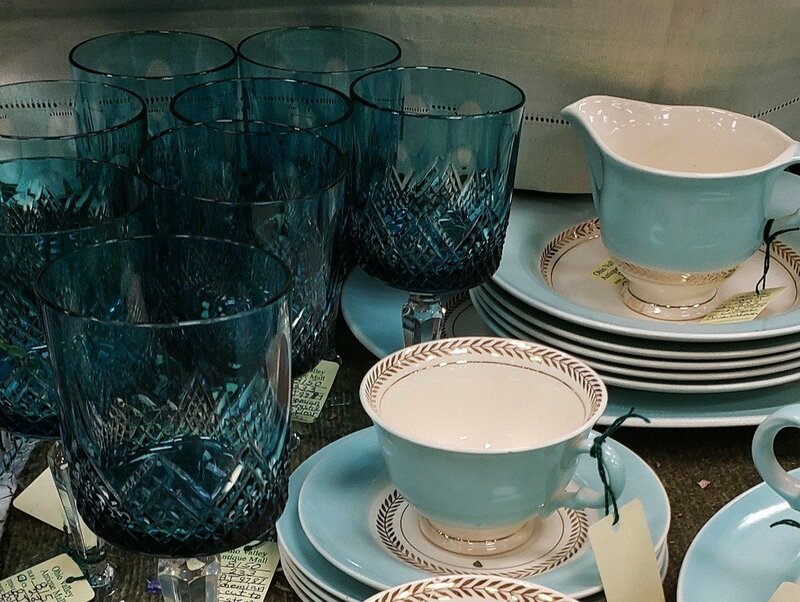 The store is more like a showroom with items easy to see and Ohio glassware sorted by manufacturer. Definitely a must-stop for antique lovers. It was here that we heard about our next stop, which leads me to the part where I may have found a treasure or two on this trip. 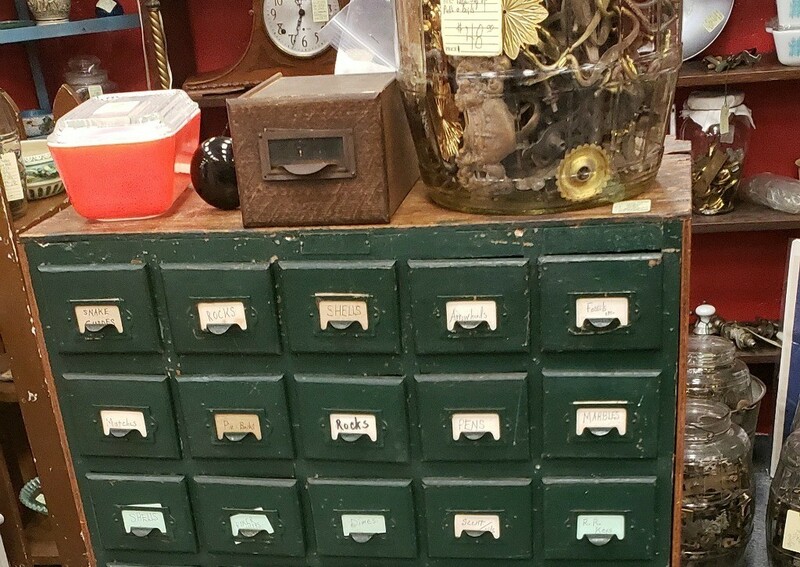 The Ohio Valley Antique Mall in Fairfield has over 550 dealers and has been voted one of the best places to shop in the Cincinnati area. My mom and I spent a couple hours in the store and only got less than halfway through. 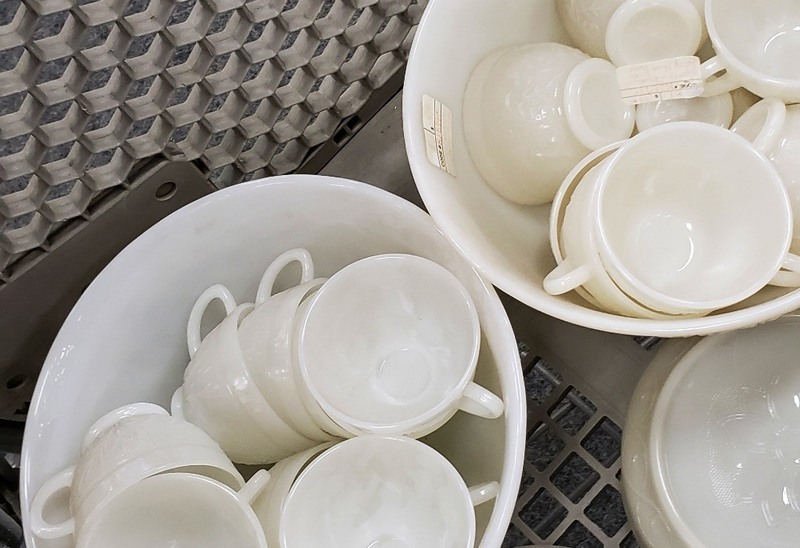 But it was a fruitful expedition as I spotted a milk glass punch bowl set tucked away on a bottom shelf within the first 15 minutes of us stepping inside the door. I hadn’t even bothered to get a cart, that’s how sure I was that I was not going to spend money in this store. Boy, was I wrong! As we continued browsing up and down the aisles, I spotted another punch bowl! The second was larger and easier to spot. I couldn’t believe my luck, but it didn’t stop there! Around the corner, within 30 minutes of entering the store, I had found not one, not two, but THREE punch bowls. Three punch bowls may have been on my wishlist, but I knew I couldn’t purchase all three. Painfully, I decided on a single punch bowl set, the second one I had found and put the first and second, which were matching sets, back where I found them and that is where they would have stayed had I not talked to my husband later that night. 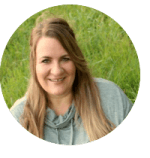 I excitedly shared my finds with my husband and told him all about my punch bowl. I may have even sent him photos of the elusive item that had been found. When he asked how much it was and how much the other two were, he asked why I hadn’t purchased the others as well since they were really a great deal. After dinner, we rushed back to the antique store to find the punch bowl sets that I had replaced on the shelves. We found #1 easily enough and then the hunt for #2 commenced. 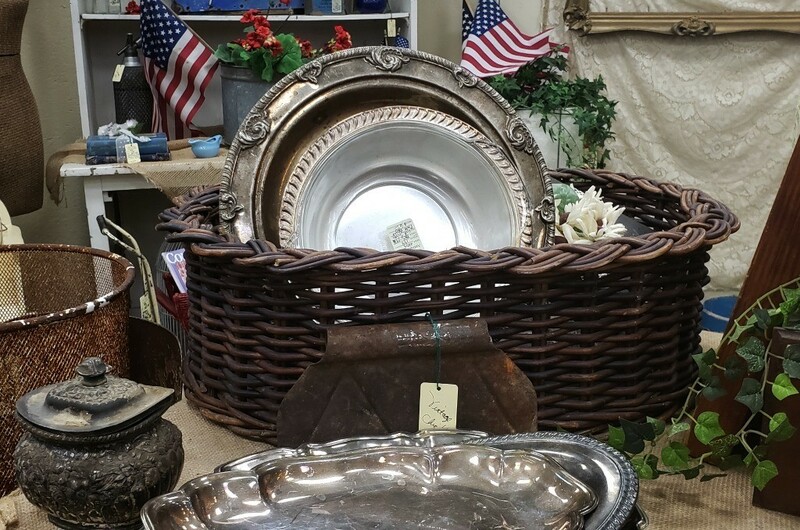 Using the same tactics from the thrift store, mom ran one way while I went the other, our eyes scanning the tables, shelves, and aisles for a glimpse of the treasure that I’d put back. My heart rate picked up a bit when a voice over the loudspeaker announced the store would be closing, advising the customers to take their purchases to the front. Just when I was about to give up and declare it a loss, my eye scanned one last booth and on an end shelf, tucked behind a green Pyrex bowl was the set that I had failed to purchase earlier in the day. After retrieving my mom, we made our way to the front of the store, amazed at our good fortune. 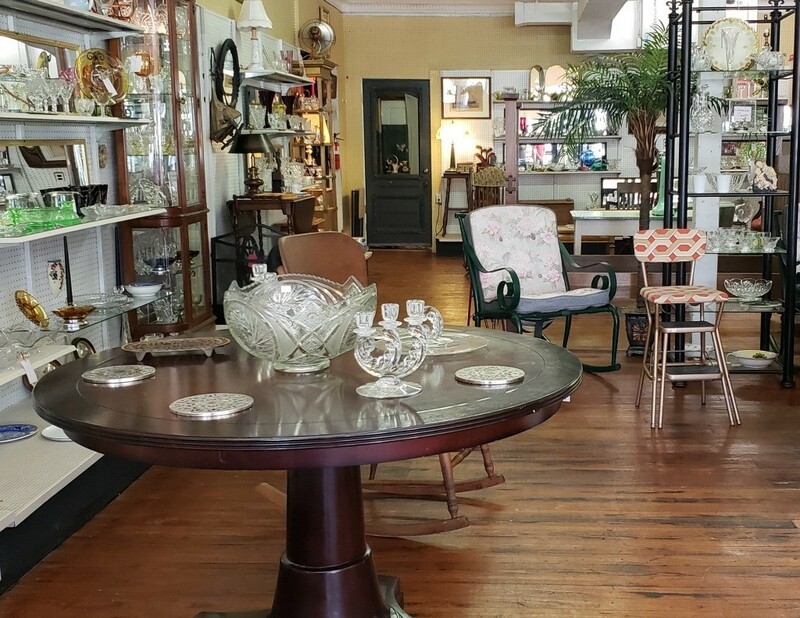 The Birdhouse Antiques, Hamilton Corner Antiques, and The Ohio Valley Antique Mall are all great shops to explore on a rainy or hot day. Just make sure you have your wallet handy- you’ll probably find several treasures to take home too. And while I’ve mentioned these stores specifically, it’s only because these are the stores that my mom and I had time to explore on this trip. 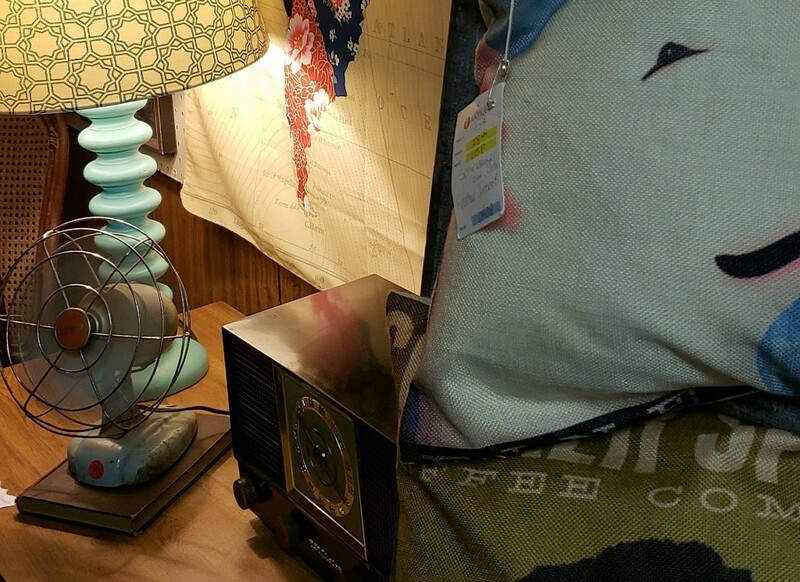 There are many more antique stores in Butler County, Ohio to browse. 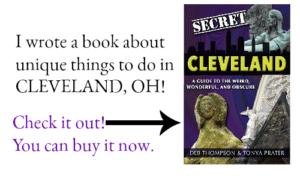 For tips on more things to do in the area, contact the Butler County Ohio Visitors Bureau. Hours: Monday-Saturday 9 a.m. to 9 p.m, Sunday 10 p.m. to 6 p.m. Tip: You’ll find specialty items and collectibles in the display case in the front of the store. Hours: Monday- Saturday 10 a.m. to 7:30 p.m., Sunday 12 p.m. to 6 p.m. Tip: Visit on Mondays when all items are 25% off. Hours: Monday- Saturday 11 a.m. to 5 p.m., Sunday 12 p.m. to 5 p.m. Hours: Closed Monday, Tuesday- Saturday 10 a.m. to 5 p.m., Sunday 11 p.m. to 5 p.m. 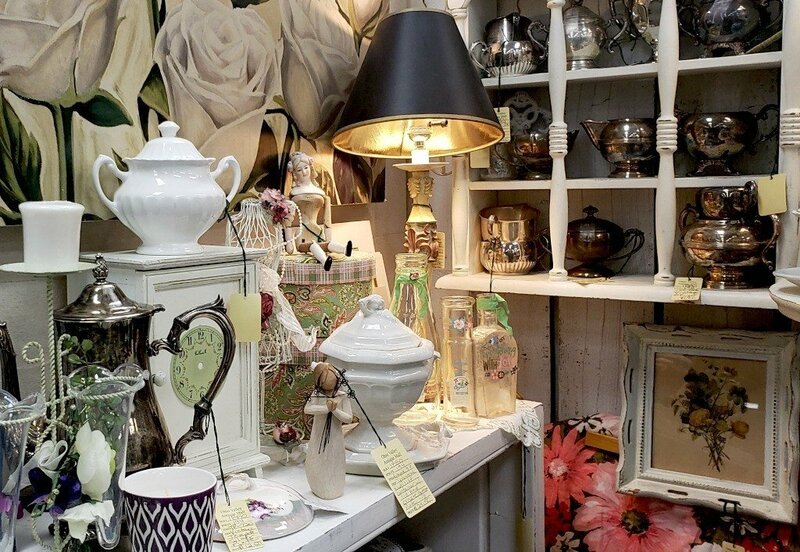 Hours: Open 7 days 9 a.m. to 9 p.m.
Do you enjoy browsing antique stores? Is there something that you collect?